She wobbled and waved around, veering close to a parked car, then caught her balance and straightened the handlebars, and she was off … the first revolutions on another cyclist’s journey. 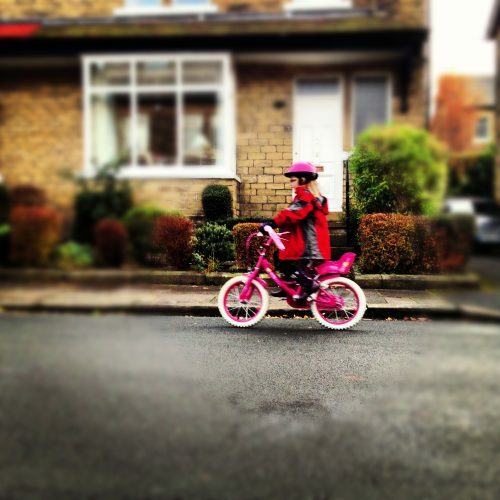 Her first ride without stabilisers. I remember doing the same thing, on a Raleigh Tomahawk – the smaller version of the famous Chopper – and I can still feel the fear and the thrill of those unsteady first outings, how it seemed so alien to be upright and moving on just those two thin wheels, but how it also felt so natural and full of possibility. Soon, I was on a BMX, hurtling down snickets and alleys towards shoddily built ramps, dust and stone chips flying everywhere as chunky tyres bit into the track, launching skywards and flying for the eternity of a second before crashing into the dirt with a jolt and a thud. There were no helmets or pads, and how I survived is quite difficult to work out. There will be spills, there will be tumbles, bumps and bruises, and she’ll cry and wail, but she’ll pick the bike up every time and get back on, because that’s what she does, and that’s who she is. This recipe sounds absurd. It’s a method of cooking gammon, or ham if you’re American, in Coca Cola. Step back from this and consider … Coke is little more than a very sugary liquid with overtones of caramel, vanilla and cinnamon. It’s a perfect poaching liquid for pork. A whole gammon is probably north of 4kg in weight, and will feed a small army. I used a 2kg piece this time, which fed five for dinner, with leftovers for sandwiches on Sunday, Monday and Tuesday lunches. It goes a long way. Place the gammon in a large pan and cover it with Coke, about two litres should be enough. Top the Coke up with water if there isn’t quite enough. Add a whole peeled onion, a carrot and a stick of celery to add some extra flavour and bring the liquid to a gentle simmer. Cover the pan and poach for about thirty minutes per half kilogramme, plus another half an hour on top. If the gammon came straight from the fridge, add another ten minutes. This is all part of being a father, seeing your children grow and take these little steps to independence, each one progressively bigger and bolder than the last. This isn’t the first, and it won’t be the last. There will be many more, and some will hurt me more than this one. She’ll make choices and take chances, she’ll revel in her freedom and her independence, and I’ll watch, scared and proud. She may fly. She might take that pink bike, with its rattling wheels and squeaking brakes and seat for a doll and she might ride it with the same carelessness I used to ride my BMX, but I hope she doesn’t, at least not without a helmet. More likely that she’ll potter up and down the street, lost in her own world of make-believe, concocting elaborate stories in her free-range imagination, stories of dancers and princesses and looking out for other people. When the gammon is cooked through, fish it out of the pan and let it rest for a few minutes before cutting away any string or netting and then carving off the skin, leaving a thick layer of fat behind. Score the exposed fat in a criss-cross pattern, making diamond shapes that should be studded with a clove in each. The ham, as it now is having been cooked, needs a glaze. 100g of soft, brown muscavado sugar, two tablespoons of honey and a tablespoon each of Dijon mustard and English mustard powder should do the trick. Smear the glaze carefully over the ham and roast in a hot oven (200c) for about fifteen minutes, until the glaze darkens and starts to caramelise. Either serve the ham warm or let it cool completely and carve thin slices for sandwiches. It’s very satisfying knowing there’s something as good as this sat in the fridge. She screeches to a halt in front of the bench I’m sat on, drinking coffee and reading a book. “Dad, I’m going to spell something out, and you have to guess what it is!” she squeals, the plan and the thoughts still forming in her mind, bursting to get out. And she turns away, pedaling off in another big circle, wheels rattling, blonde hair streaming from underneath her helmet, off on another adventure. “Did you get it?”, she asks later, her green eyes, my own mother’s eyes, gazing at me with mischief. “I got it”, I tell her, “and I love you too”. And I don’t tell her anything else, because that’s enough and because I know she can’t really understand, but I’ll always love her. Always. Maybe someday she’ll have a child, too, and then she’ll see what I see and feel what I feel, but for now, she doesn’t need to. She just needs to know that I’m there for her, and I’ll catch her every time she falls. I can’t promise to be a perfect father, but I can promise to try, and I can hope that she feels the strength of that effort, and I hope that it makes her feel safe and able to grow up in her own way, the vision of herself. That is completely beautiful RIch. What a lucky daughter to have such a proud and doting dad. That’s so sweet. Lovely to treasure these moments – she won’t realise the significance until she has her own children. Lovely post I found through Jen on fb. Such a great reflection on parenting.